Meditating upon these aspects, AzhwAr, due to great desire, calls out with great urge “You who have such qualities, should mercifully manifest your form so that I can see it”. For one who is set out to surrender [to emperumAn], this urge triggered by the desire in the goal, is the qualification. AzhwAr requested the birds to go as his messenger in “enguch chenRAgilum kaNdu” (wherever you see him) and in “vAnavar kOnaik kaNdu” (seeing the leader of residents of paramapadham); he made them melt and not go (as messenger) by his sorrowful cry; when it is said that the achEthanas (insentient entities) will feel sorry as in thiruvAimozhi 6.5.9 “marangaLum irangum“, there is no question of birds who have a little bit of consciousness, not melting; when AzhwAr said in thiruvAimozhi 6.8.11 “URRinkaN nuN maNal pOl urugA niRpar nIrAyE“, that did not exclude the birds who were ready to go as messengers. Now, there is no one to carry his message in his close proximity. Seeing “as the achEthanas are also melting, would paramachEthanan (supreme lord) not melt?’, AzhwAr tries to bring emperumAn by crying out loud. While he has the sorrowful cry, does he need anyone else to go as messenger? He is crying out so loud that emperumAn cannot sustain himself in paramapadham which is said as “kalangAp perunagaram” (the great town where there is disturbance) and will rush towards him. For the messengers, there are limitations in their feet or wings; but there is no limitation for his throat! Just as sIthAp pirAtti’s prison time [in lankA] cannot be cited a reason, AzhwAr’s suffering also cannot be cited with a reason. Just as sIthAp pirAtti’s stay in lankA is for the benefit of others, his suffering is also for the benefit of others. As SrI vAlmIkI bhagavAn documented sIthAp pirAtti’s prison time in lankA for the uplifting of the world today, though AzhwAr suffered, his prabandhams are like a water-booth in summer time for the world. Just as krishNa tormented the gOpikAs of gOkulam with music from his divine flute, AzhwAr torments emperumAn with his voice. emperumAn feels in his divine heart “Come on! Why are you troubling me such that I cannot remain peacefully here! Did I move away from you? I have manifested my jagathAkarathai (having universe as my body) which means that whatever you hold on implies that you are holding on to me”; AzhwAr says “What is surprising about that? Do I not have the knowledge that you have the universe as your body? It is only this knowledge which makes me desire to see your distinguished form”; AzhwAr says when there is one which is apt for me, if you show me something else, it is useless. Since that (universe, universal form) is also not outside the purview of your wealth, I will accept that; by that, my bewilderment of considering your wealth as mine, is eliminated. arjuna too, after seeing the viSvarUpam, requested krishNa to manifest his distinguished form as in SrI bhagavath gIthA 11.46 “thEnaiva rUpENa chathurbhujEna” (please assume your four shouldered form as before). AzhwAr says “even if you don’t come taking pity on hearing my sorrowful cry, you should come here so that your wealth does not melt away”. AzhwAr’s sorrowful cry makes it difficult for emperumAn to remain peacefully in both spiritual and material realms. 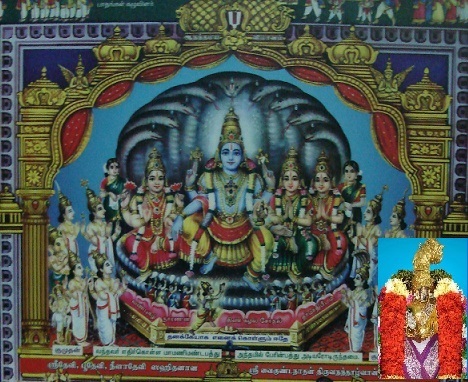 This entry was posted in thiruvAimozhi, thiruvAimozhi 6th centum on May 18, 2018 by Sarathy Thothathri.